Other than a handful of technical nominations, the flag-less First Man earned only shade from Oscar this year. A number of factors worked against director Damien Chazelle’s biopic about Neil Armstrong (Ryan Gosling), the first man to walk on the moon. Gosling’s Armstrong just mopes. Other than a couple of eye-rolling moments that don’t make sense, that feel like movie moments as opposed to true to the character, Armstrong’s pain only makes him mopey.” There is no depth to this, which means there is nothing interesting about it. Through it all, and to his credit, Armstrong remains a loving (but mopey) husband and father, a faithful (but mopey) friend, a dedicated (and mopey) and competent (and mopey) space explorer. Eventually, all of this moping becomes tedious, and it certainly doesn’t help that the movie as a whole adopts this tone, a tone of controlled restraint that turns oppressive, most especially as we move closer to what should be a cathartic and exciting climax: the aforementioned moon landing. But even this is presented in the most constipated manner possible. First Man depicts the most thrilling adventurer and adventure of them all as a mope in a can. Secondly, First Man was a box office disaster, earning just $45 million domestic; and this was not some tiny indie movie. First Man was positioned as an A-film with major stars depicting one of the most consequential moments in human history. The promotional rollout was massive and rode the wave of festival raves as it opened in 3,640 theaters. When a movie like that crash dives at $45 million, what you have on your hands is a serious case of audience rejection. On top of the movie not being very good, there was the whole flag controversy. 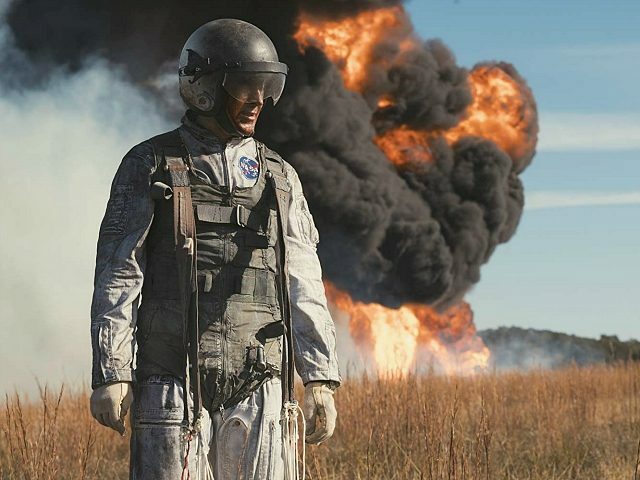 Chazelle’s bizarre choice to not depict the whole reason for the moon landing — for America to be the first country to plant its flag on the lunar surface — didn’t sit well with an American population already suspicious of an entitled and ungrateful entertainment industry openly hostile to the country they owe everything to. And then there is my favorite part — the backlash over First Man’s lack of racial representation. Apparently, Neil Armstrong should have been played by a black transsexual, or something. The Academy got this one right. Technically, First Man deserves the acknowledgement. Unfortunately, the movie itself is stillborn and poorly performed, which is not the fault of the actors, but of a director whose pretensions got the best of him.